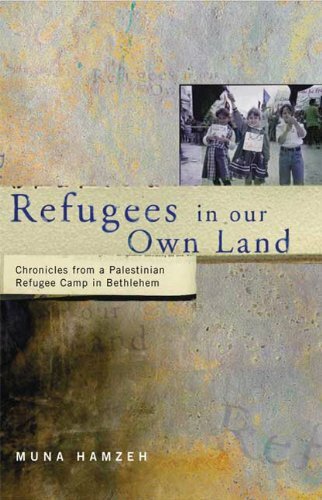 This book is an eye-witness account of what it is like to live in Palestine as a refugee in your own homeland. The author first worked as a journalist in Washington DC, but moved back to Palestine in 1989 to cover the first Palestine Intifada. Muna Hamzeh is a Palestinian-American journalist whose work on the Palestinian question has appeared in The Economist, Ha'aretz, The Christian Science Monitor, Jerusalem Report, and Middle East International, among others. Hamzeh was born in Jerusalem to a Muslim father and a Christian mother, both of whom were half Palestinian, half Lebanese. She lived in the Dheisheh refugee camp in Bethelehm from 1988 - 2000. She is currently based at the Univeresity of Texas at Austin.